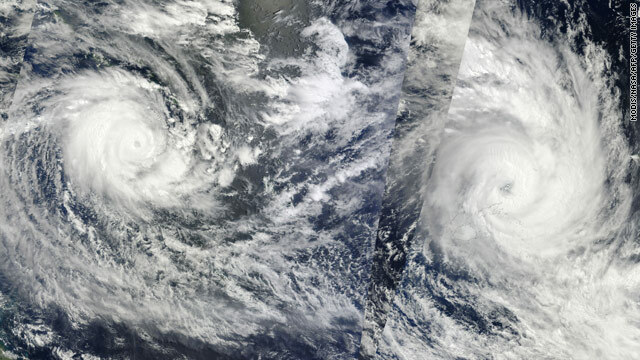 A NASA satellite image shows Cyclone Tomas over Fiji, right, and Cyclone Ului over the Solomon Islands, left. (CNN) -- Fiji emerged from the shadow of Tropical Cyclone Tomas on Wednesday, with officials reporting one death and widespread damage to the South Pacific island chain. Authorities reported one death in northern Fiji. "It is evident that wherever Tomas has struck, the damage has been overwhelming," said Commodore Frank Bainimarama, Fiji's prime minister and military chief. "However, the full impact of Tomas in the northern region, the Lomaiviti and Lau groups, is yet to be determined. "All we can say at this stage is that the effect of Tomas in these parts of Fiji was extensive and damaging," Bainimarama said. The northern and eastern parts of Fiji sustained severe property damage, and some areas experienced extensive flooding, according to Winston Thompson, Fiji's ambassador to the United States. The one-time Category 4 storm battered Fiji's northern islands for parts of three days, with gusts up to 275 km/hr (170 mph). The Ministry of Health issued an urgent call for blood donations after the storm. "Over the past four days, we have been using a lot of blood for surgery cases," a statement said. Thompson said he expected damage from Tomas to top the estimated $25 million in damage caused by Tropical Cyclone Mick in December.